Dean Gilmour and Michele Smith of Theatre Smith-Gilmour bring to life the bizarrely adventurous and darkly humorous tale of a family’s Odyssean journey to bury their deceased mother, in William Faulkner‘s As I Lay Dying, playing at the Theatre Passe Muraille main space for the month of March. In a re-imagining of this tale told in a manner very reminiscent of O Brother Where Art Thou, this is an adventure you won’t soon forget. The story follows the Bundren family as they struggle to fulfill Addie Bundren’s (Michele Smith) dying wish of being buried in her hometown of Jefferson, Mississippi. The seemingly endless 40-mile journey is filled with chaos, upheaval, and personal agendas as each family member struggles with what this promise to dearly departed mom and wife means to them. When Faulkner wrote this novel, it came together in a stream of consciousness narrated at different intervals by over 15 characters in over 60 chapters. To say that this story – borrowing its title from Homer’s The Odyssey – is cacophonous is an understatement. 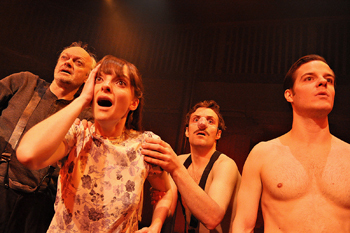 Adapting this story to the stage was no easy feat for creative directors Gilmour and Smith, it’s evident in the performance – numerous blacked out transitions spotted often times with rather short scenes, ongoing side stories, character monologues – that can at times be distracting from the flow of the story, but eventually everything gets strung together. There’s a lot going on in this play, much that requires a lot of physicality from the actors. At times it left me wishing a few more props were used to take away from the miming and lessen the confusion. There’s a lot of movement to imitate action scenes – getting caught in a flooding river struggling to save mom’s casket, getting caught in the burning stable – and an actor was even used to play a mule. I’m having a hard time falling entirely in love with this performance though there was still plenty that I found entertaining. It’s a longer production, 140 minutes with one intermission. The numerous transitions at times did take me out of the performance and I couldn’t get over the use of the fake noses to depict different characters or towns’ people. I mean I understand the concept but it just didn’t jive for me. The physical acting was also a tad confusing but well executed. My friend Lyanne attended the performance with me and she thoroughly enjoyed it, having read Faulkner’s book previously, she was impressed with the writing of this on-stage adaptation. The performance is riddled with, for lack of a better term, “hick humor”. Hillbillies in the deep south – the same kind of humor that got you laughing at O Brother Where Art Thou – is packed in this production and well executed by the cast. I was particularly drawn to Nina Gilmour as Dewey Dell Bundren for her feisty portrayal and dedication, especially her own side story running to the drug store to deal with a certain “problem” and the ensuing argument. I was also thoroughly impressed by Gilmour’s portrayal of the patriarch Anse Bundren – his selfishness that both propels and antagonizes the family, his greed, his blunt delivery, right down to how easily he became distracted at the sight of a pretty lady even while hauling around the casket holding his dead wife. Gilmour did not hold back in turning Anse Bundren into the man everyone loves to hate. And, the fact that Gilmour bears a striking resemblance to Jack Nicholson in The Shining added to my appreciation. It’s not the easiest story to follow along with, but neither was the original novel. Bearing that in mind, Smith and Gilmour do a great job bringing it to life with a lot of darkly humorous laughs along the way. Performances run from March 8 – 31 at 7:30pm, excluding Sundays and Mondays, with additional matinees on Saturdays. Tickets are $25-$35 for general admission and $20-$30 for students and art workers. Saturday matinees are PWYC. Tickets can be purchased online or by phone by calling 416 504 7529. Photo of Dean Gilmour, Nina Gilmour, Dan Watson, and Julian De Zotti by Katherine Fleitas.